The Wanderers came from behind to secure a second place finish on the ladder. John van’t Schip picked the retiring Harry Kewell upfront, while Ben Garuccio moved back to left-back, and Massimo Murdocca dropped to the bench. Tony Popovic made three changes from last week’s draw with Brisbane Roar. 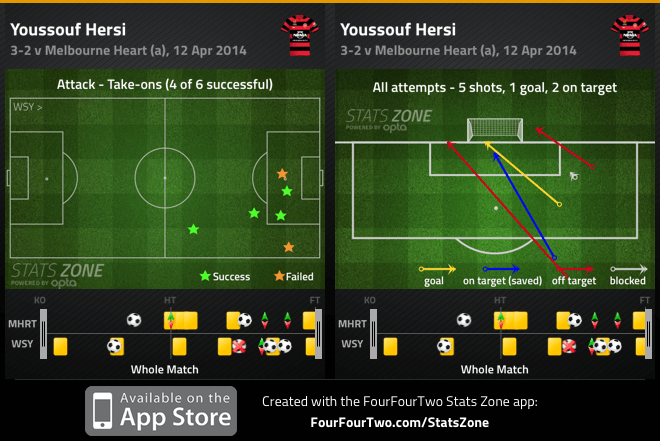 Tomi Juric started upfront with Youssouf Hersi on the right, while Iacopo La Rocca started in place of Aaron Mooy in midfield. Both sides struggled to control the space between the defence and midfield, which lead to lots of freedom for the attackers, especially the deep-lying forwards. 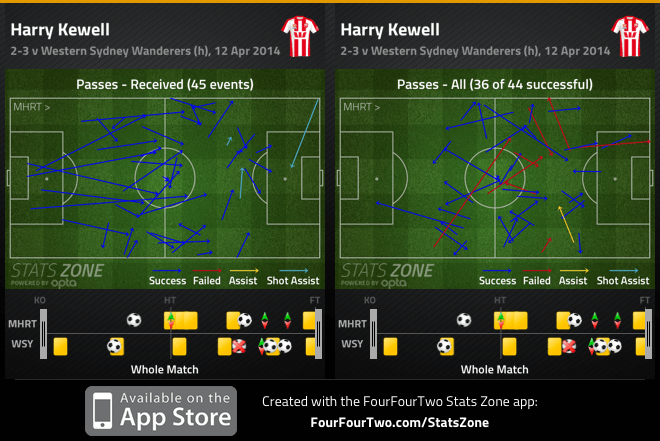 Fittingly, in his final match as a professional footballer, Kewell was the centre of attention – literally, as he started upfront in a 4-3-3, but dropped deep to link up play and bring the wide players inside. Whether using him or David Williams upfront, Van’t Schip has encouraged this false 9 movement, with the forward coming short into the space in front of the centre-backs to drag them upfield. Here, Kewell was even more varied than that, sometimes dropping very deep into midfield to collect possession, but caused most problems when positioning himself between the lines – his clever dummy set Mate Dugdanzic free down the right, with Williams blazing the eventual shot over the bar, while Nikolai Topor-Stanley was booked when storming into a challenge on Kewell. There was also the Williams chance 23 minutes in: although Kewell is a bit deeper here, closer to the halfway line, but it still illustrated how his movement creates space for the wide players to cut inside on the diagonal – Williams again smacks the shot too high. This pattern of play was also crucial for their equalising goal – Kewell’s movement deep leads to the initial foul, which he takes the free-kick quickly to tee up Orlando Engelaar for a fine long-range strike. There was a similar problem at the other end, particularly because the Heart centre-backs (especially Patrick Kisnorbo) were keen to stick tight to deep-lying forwards. Furthermore, the structure of the two midfields – the Heart use a 1-2 shape, the Wanderers a 2-1 – meant they were aligned, but as the Heart midfielders were keen to stick tight to Shinji Ono, it meant when he drifted wide or deep, it created space in between the lines for the other attackers to move into. Mark Bridge was especially narrow here, and found space a couple of times to create attacking moves – one, in particular, lead to Jerome Polenz crossing dangerously from the right. Another good example was a Juric shot from range around the half-hour mark: Ono pulls to the left of Jonaton Germano, and as the Heart player tracks his run, Juric drops off in front of Kisnorbo and finds lots of space to put the shot on target. It’s worth considering why the Heart, with three midfielders, seemed so open in those pockets of space in front of their back four, and it’s worth comparing their approach with a side that use a similar formation, Sydney FC. However, where it was clear in Sunday’s match against Perth that Frank Farina was happy for his side to crowd out the centre of the pitch without the ball and commit very few numbers forward, Van’t Schip likes his side to play proactively in possession – and so as the Heart midfield spread out to create angles of pass, so the ground they must cover to protect the defence without the ball increases, opening up space that wouldn’t exist if they were without the ball for long periods. The problem, too, was exacerbated by the fact that the midfield trio rotate who is at the bottom of the triangle, so there was no permanent holding midfielder. The overall pattern of the game, however, was the Heart dominating possession in deep positions but finding it difficult to play around the Wanderers first line of defence, with Ono and Juric dropping behind the ball to block passes into midfield. Surprisingly, even when Germano dropped in between them to create a 3v2 advantage, the Heart struggled to work the ball forward along the ground, and mostly just passed the ball between themselves at the back, as illustrated by the most frequent passing combinations. A minor area of strength was down their left, where Garuccio pushed forward manfully in support of Williams and helped create neat triangles down that side. However, Williams was forced off at half-time, meaning Aziz Behich came on in his place – ten minutes later, though, Garuccio was yellow-carded and promptly swapped with Behich, so now the latter was at left-back. This was probably Van’t Schip’s precaution against the dangerous Hersi, who received balls wide on the right and dribbled directly towards goal. 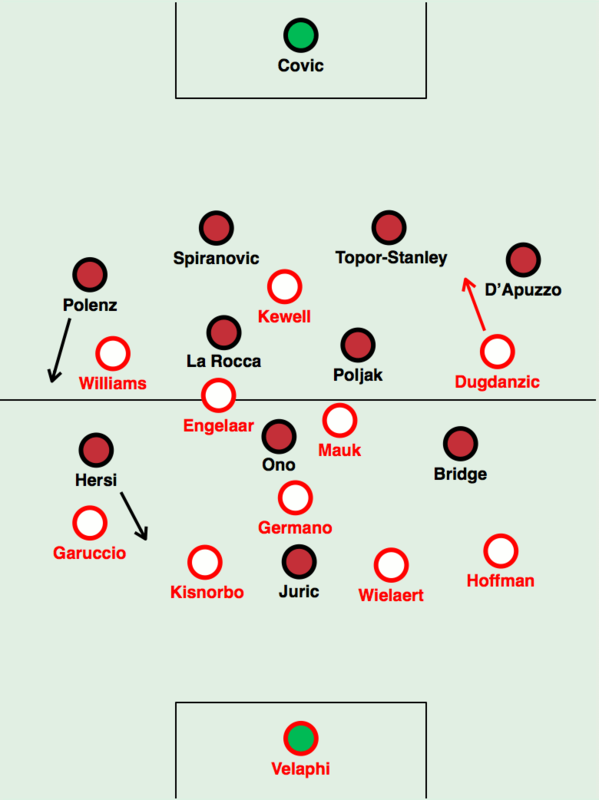 Using two left-backs in tandem subtly changed the dynamic of Heart’s play down the left – now, instead of Williams carrying the ball forward purposefully, Garuccio stayed wider, held the ball and waited for overlapping runs. This combination lead to Kewell’s volleyed chance right in front of goal on the hour mark, while Garuccio was wasteful with a few crosses. Engelaar was also becoming increasingly influential – not only because he’s one of the league’s finest ball players (and shooters), but because of his size, which allows him to shield the ball easily as well as win longer balls from the back. The Heart were still having problems when Ono dragged midfielders away from the centre, however, and conceded a penalty when Germano followed him wide – leaving Hersi unmarked in front of the defence, where he slipped a pass into Poljak who was fouled. Shortly after, though, they scored a goal that went wildly against the game’s patterns, with Jason Hoffman getting forward to score from a deflection. That prompted Popovic into bringing on Mooy and Brendan Santalab – Mooy was more positive with his passing than La Rocca, and started the move for Santalab’s equaliser by finding Hersi with a clever straight ball. With five minutes to go, the Heart found themselves in a mess trying to clear the ball – Hersi pick pocketed Germano and slotted the winner past Tando Velaphi. There were several interesting tactical features here – with both sides struggling to control the space between the lines of their midfield and defence – but the game was actually defined by five goals that effectively were against these trends. One from a set-piece, two that should have probably been disallowed (Engelaar’s and Santalab’s), a fortunate deflection and the last goal, which summed it up – Germano really should have cleared it long before Hersi was able to steal it off and score the winner. Individual errors have been a huge problem for the Heart all season – it’s hard to forget how disastrous the finishing was in particular under John Aloisi – but it’s worth questioning whether those errors are compounded by the structure, which encourages the side to play very wide when on the ball, making them vulnerable in those seconds of transition when the ball is turned over. The Wanderers, meanwhile, will both enjoy the week off and confidence boost this come-from-behind win ensured. Popovic’s main priority this season has been to balance the dual commitments in the league and in Asia. Although the exact specifics of those he’s rotated can be questioned, it does feel like the squad is fresh for the finals, which is, after all, how this competition can be won. As long as there is a finals series, teams will be happy to make the top 6 and then ‘restart’ from the elimination matches – the Wanderers, more than any other side, look set to benefit from this.